Police said today that they've made an arrest in the hit-and-run death of Chaim Joseph, a 72-year-old East Village resident who was struck by a private oil truck shortly before 6 a.m. on Feb. 4 while he was riding in the bike lane near the intersection of Eighth Avenue and West 45th Street. According to published reports, the NYPD arrested 56-year-old Queens resident Kenneth Jackson, who worked for Brooklyn-based Approved Oil company. As Streetsblog reported, Jackson was charged with failure to yield and failure to exercise due care. The charge of failure to yield suggests that police believe Joseph had the right of way and was pedaling with the light when Jackson allegedly ran him down. Jackson ... faces a maximum of 30 days in jail — although such sentences are rare. Days after Joseph was killed by the oil truck, police responded by ticketing cyclists a block from the hit-and run site. The following day cyclists rallied outside the Midtown North stationhouse. 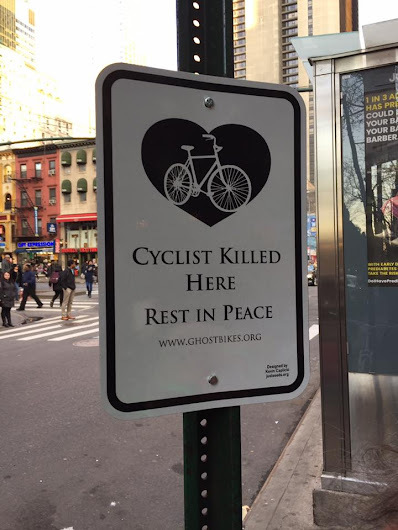 On March 11, cycling advocates installed a ghost bike for Joseph on Eighth Avenue and 45th Street. Via the Families for Safe Streets Facebook page: "We learned of his beautiful acts of kindness, his commitment to social justice, his generous spirit and his deep respect for all living beings." Police say that Jackson was driving the truck for Approved Oil Company of Brooklyn when he killed Joseph. Jackson is the third reported driver from Approved Oil to kill a pedestrian or cyclist in the last two years. In an email, Approved Oil attorney J. Bruce Maffeo said, "There is no evidence that Ken Jackson was driving negligently or aware that he had hit the bicyclist who was dressed in dark clothes and traveling at night. As a result the police who investigated the incident declined to arrest him at the time and correctly saw the tragic incident as an accident—nothing more or less." Maffeo added, "The charge against Ken involves an untested NYC statute that criminalizes any motor vehicle accident involving a fatality. While Ken and Approved Oil sympathize with the victim and his family, neither he nor the company acted negligently, much less criminally, in this case and intend to vigorously contest the charge." Joseph Cutrufo, a spokesperson for Transportation Alternatives, countered, "This crash happened in midtown Manhattan, a block from Times Square, where there's no shortage of light. And last we checked, it's not a crime to wear dark clothes. It is, however, against the law to kill a person with an oil truck." "Jackson ... faces a maximum of 30 days in jail — although such sentences are rare." Due to the disparity in mass and thus, the ability to do more damage, there should be a minimum of a $1000 fine, if a motorist hits a pedestrian or bicyclist, otherwise there's no deterent to driving like a reckless a$$hole. Unless real consequences for this type of behavior are implemented, the excuse will always be: "oh, I didn't see him or oh, it was just an accident", etc. They did implement something like this in the Netherlands about 12 years ago. In any accident involving a driver and a pedestrian or cyclist, the driver is presumed to be at fault unless proven otherwise. The theory is that the driver is the one with the most dangerous machine and therefore has to exercise the most care. The accident rate dropped in half. @DrGecko That would never fly here. What, no charges of leaving the scene? What is wrong with this city? In the case of an oil corporation versus a dead, old man, I can't anticipate a lot of justice being served. Shame on them and their crocodile tears.